It’s likely you have seen the statistics, which routinely state fifty percent or more of all CRM deployments fail to be adopted by users one year after the “go-live” date. A quick internet search will lead you to study after study, so I’ll spare you the links. However, if you search for why they fail, you will find success recipe’s by the dozens, but little insight into the actual root causes. Gaining a deeper understanding of these root causes is essential while building a foundation for success in a CRM deployment project. Routines or “habits” are hard to change, we all know that well from our attempts to change our own. Organizational habits are a collection of individual habits, increasing the degree of difficulty exponentially. It’s not that business people don’t like change, as is commonly echoed, it’s that people become frustrated by the loss of productivity during the process of change. Especially when they are on tight deadlines and/or are reaching for stretch goals, which is just about always. Poorly planned and executed new system deployments put people in the position of not being able to complete what they were able to yesterday, right when they need it done today. If you have ever been the business “user”, you are very aware of the resulting high level of frustration. When faced with this situation on a repeating basis, business people find their own work arounds, ones they can depend on. Workarounds add to their resistance to adopt the new system, almost sub-consciously, as they seek to maintain their productivity. Similar to a life preserver when lost at sea, the work arounds are for survival, people are quite resistant to give them up. Depending on the percent of the overall team operating in this mode, the project can fail as everyone quietly decides the new system will never work. Why invest the effort? This organizational saga has been playing out all my career, likely since the invention of the organization, but it is more acute with CRM deployments. Why? It’s partially because many companies opt to deploy salesforce automation first, and sales people are hot wired to focus on productive activity. Sales people that don’t think this way usually fail at their profession early. Top notch sales people learn this early in their career, and adopt it as a philosophy. Suggesting change is equivalent to suggesting taking a pay cut. The new system deployment project sits opposed to their success philosophy. Add to that some independence tendencies, and you get the picture of the root obstacles to successful adoption. Fortunately, the marketing automation leg of CRM doesn’t have the same degree of adoption hindrances. Still, a successful implementation of salesforce automation is a gold prerequisite for successful marketing automation implementations, especially in organizations that sell to other businesses. Marketers are very motivated to adopt systems that will enable them to follow to conclusion the business outcome of the hard earned leads they generate. If the salesforce automation adoption is successful, they will strive to integrate with it. However, they do face the same initial productivity loss as the new system is deployed. In chicken and egg fashion, the sales organization gets very motivated when they start seeing quality leads generated from a successful marketing automation deployment. This is when they get motivated to learn deeper skills and go through learning curve 2. If you can reach this milestone, you will succeed with sales force automation. Customer Service, the third leg of CRM, benefits from information getting organized in one place from disparate systems. Customer service reps readily adopt tools that enable them to view all the related information for a customer situation. Adopting new systems that enable resolving more issues in less time comes naturally for people in this role. Contrast this with asking your sales professionals to adopt systems that require them to start completing “additional” tasks and it’s obvious why customer service lead implementations fail far less often. 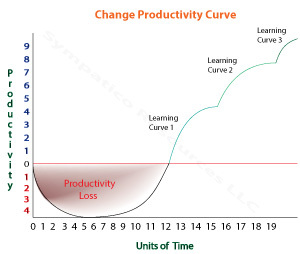 The initial loss of productivity varies, but is usually of short duration. The antidote for the frustration is not complicated. First you have to make the user community aware that they are going to suffer an initial productivity loss with the new deployment. Second, you need to have enough expert support available to support new system users while they are going through the productivity trough. And third, you need the learning plan activities properly timed for each phase of deployment. And of course you must communicate these challenges up front so the team can see the bigger picture. All CRM deployment projects that fail were initially expected to succeed. Time and time again, the root causes that drive user behaviors are not surfaced, discussed, and aligned for success. Realizing you would behave the same if placed in the same situation is a big first step to success. This common lack of clarity regarding other’s perspective is a root cause of CRM failure.